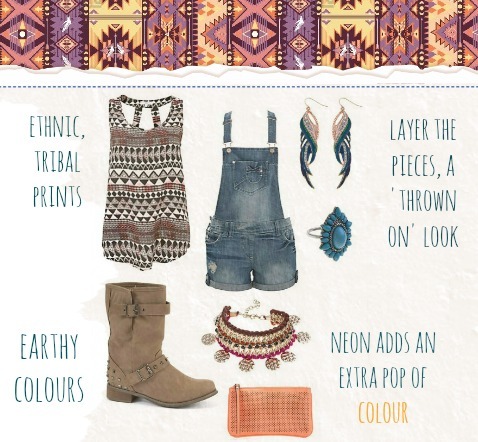 Here I decided to have a go at MoneySupermarket's 'Passion for Fashion' competition and see what I could come up with! The idea is to create three themed outfits - 'Casual', 'Holiday' and 'Party' - all within the £200 mark. I headed straight for New Look first because their clothes are super affordable - they always have offers on - and worked really well with my ideas! I will link back to each item after I publish so you can view the clothes on the site :) As it turns out I love bohemian fashion. A lot! This is me finding an outfit I would wear casually, probably in the summer. I love the earthy colours and layers, and adding a dash of bright coral really livens it up. I also love how it looks casual and 'thrown on', the faded denim giving a vintage touch. The patterns on the top are gorgeous and bring some Eastern flair, likewise with the jewellery. Friendship and charm bracelets are also really fun to make so I might save a penny and create my own! Here I've gone all romantic with the flowy dress and cowboy boots. I mentally called this look 'Golden Sands' because it would be perfect for strolling along the beach in the evening :) The colours in the outfit mimic the sea and white sand so it would harmonise with my surroundings if I were on holiday. 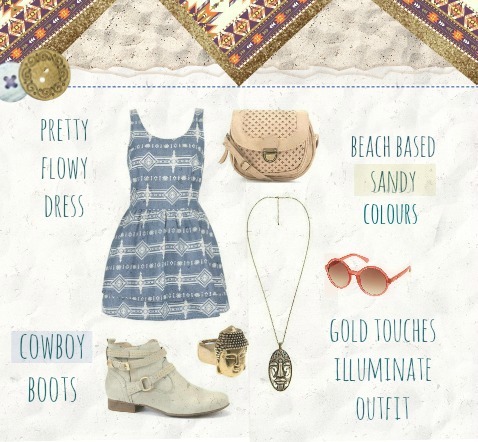 The gold jewellery illuminates the outfit and the Buddha faces add bohemian spice. The lattice bag is a cute vintage touch! I've kept it quite formal/sophisticated with monochrome colours, but there's still an element of fun with the playsuit, which is a creative alternative to a dress. The flower earrings are really cute, the pastel pink turning it a little parisian chic. 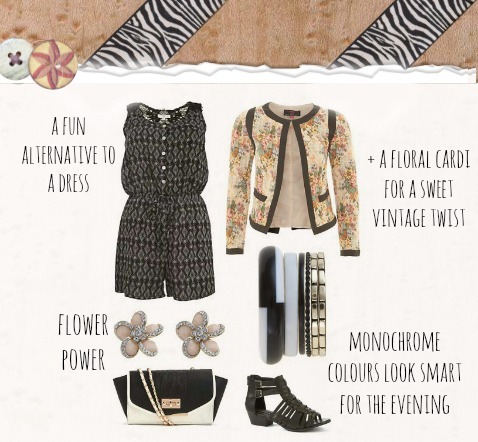 And the floral cardi makes for a sweet vintage twist, recollecting 60's style! This was so much fun to create in my lazy Tuesday afternoon! Lovely outfits! I love the play suit in the last one. The party look is beautiful especially as I'm a big fan of monochrome at the moment! Please pop round my blog and enter my giveaway for your chance to win some soap and glory items and a face massager/cleanser! Love all the looks. The Holiday one in particular has such a cute dress and such nice colours! I just found your blog and it us super nice. Love all your interesting things that you post about. Just my style..hehe. Love your blog, just discovered it, newest follower here! super cute combinations! I really want a pair of dungarees to wear this spring <33 eep they are so cool! I adore outfit 1! Been thinking of buying some dungarees but wasn't sure how I'd style them - this has given me an idea! Have a look at my latest blog post and if you like it, follow me and I will follow you back! I agree! I love the earrings! These beautiful things make our life more beautiful. Awesome post.Thanks For share this post with us. For some it absolutely was created as suggests that of reference to a selected one that has done nice opt Friendship Bracelet to the maker.Others additionally believe that it ought to be created out of specific threads and colours for various functions.